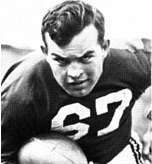 Corwin Samuel Clatt (February 5, 1924 – June 2, 1997) was an American football fullback who played two seasons with the Chicago Cardinals of the National Football League. He was drafted by the Chicago Cardinals in the sixth round of the 1945 NFL Draft. He played college football at the University of Notre Dame and attended East Peoria High School in East Peoria, Illinois. Clatt played high school football for the East Peoria High School Red Raiders. He was a first-team all state selection and named the outstanding high school player in Illinois his senior year in 1940. The Red Raiders compiled a record of 26-5-1 during his four years with the team. He was inducted into the Greater Peoria Sports Hall of Fame. Clatt played college football for the Notre Dame Fighting Irish, winning the national championship in 1946 and 1947. He was the Irish's leading rusher in 1942, recording 698 yards on 138 carries. He also played in the Chicago College All-Star Game. Clatt was selected by the Chicago Cardinals with the 45th pick in the 1945 NFL Draft. He played in 21 games for the Cardinals from 1948 to 1949. Clatt became the head coach of the East Peoria High School Red Raiders in 1957. He also coached the Red Raiders track team, which won the Mid-State 8 title in 1963. 1 2 3 "CORWIN CLATT". profootballarchives.com. Retrieved May 6, 2015. 1 2 "Corwin Clatt". gpshof.org. Archived from the original on May 6, 2015. Retrieved May 6, 2015. ↑ Smith, Wilfrid (August 1, 1944). "Corwin Clatt To Play Again For All-Stars". Chicago Tribune. Retrieved May 6, 2015.